Do not fly away from the wheels of the world-machine, but stand inside it and learn the secret of work. Through proper work done inside, it is also possible to come out. This quote from Swami Vivekananda presents three building block ideas of Karma Yoga (The Path of Work). The first building block idea is the idea of ‘engagement with life’. The second building block idea is the ‘secret of work’ also described by Swami Vivekananda as “proper work”. The third building block idea is the possibility of ‘freedom from the world-machine’. Let us explore these three ideas in greater detail. Swami Vivekananda calls ‘life’ the world-machine. This is an important description, because it characterizes life as a set of processes and actions, inexorably acting, based on their own inner logic. The world-machine acts upon us, in and through our duties, responsibilities, our desires, and the social architecture in which we live. All these and more constitute the world-machine. we can be crushed by this world-machine (i.e., be broken by life and its demands). When we respond with freedom, we engage with this world-machine with self-esteem and inner dignity, keeping our own consciousness free from the pressures of this machine. The first choice of engaging with freedom demands tremendous inner strength and a willingness to meet life on equal terms. When we follow the rules of this world-machine, we seek to cope or even ‘succeed’ in meeting the demands, expectations, and rules of the environment in which we seek to survive. The second choice is a conscious or unconscious acceptance of the ‘rules of the game’ and an attempt to ‘win’ within these rules. When we are crushed by the world-machine, it means that life and its demands leave us bereft of a sense of freedom, self-esteem and strength – and we have somehow accepted fully that the world is far greater than our best efforts and capabilities. We submit wholly to the world-machine. The third choice is one where the spirit has accepted matter as more powerful. Swami Vivekananda also refers to a fourth choice exercised by many over the ages. This choice is the desire to negate the world-machine. This negation may be done by claiming that the world is an illusion or may be a result of a subtle unwillingness to fight the battle of life due to psychological weakness or deep inertia that makes us incapable of rousing a higher spirit within ourselves. 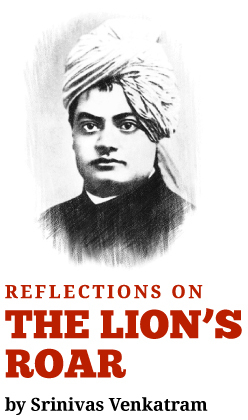 Of all these choices, Swami Vivekananda says that the only right one is to engage heroically with the world-machine, keeping our own freedom, self-esteem and dignity, our inner sense of values, intact, and adopting a mode of positive response to the challenges and expectations that swirl around us. This is the first building block idea of ‘engagement with life’. Swami Vivekananda now offers us the second building block. He says that learning to engage with life on these terms is possible if and only if we learn the secret of work. What is the ‘secret of work’? What is “proper work”? Karma Yoga says that the secret of work is ‘non-attachment to the result of work’. Proper work means to work as best as we can, without chasing the results of our work. How is it possible to work without attachment to the results of work? The answer to this is not to let go or somehow become less attached – but instead to redirect our attachment to an ideal or a higher vision of who we can be. When we are attached to the ideal, we work in much the same way as before, but we measure the results not in terms of success or failure in the world around us, but in terms of whether it helps us become more than who we are, i.e., success to us means actualizing or becoming our own ideal or vision for ourselves as human beings. We may seek to be devoted, caring people, we may seek to be heroic, courageous individuals, we may seek selflessness and compassion within ourselves – the ideal may be determined by our own orientations and influences. But in all cases, the ‘secret of work’ is measuring ourselves in terms of what we become as human beings – the quality of our consciousness and engagement with life, rather than in terms of rewards and failures that the world offers us. When this happens, the third building block of Karma Yoga becomes visible to us – the possibility of freedom from the world machine. We are able to ‘engage with life’ not to be “engaged as slaves of life”. We are free to act, and we no longer act under the compulsions of external societal expectations on our own myriad desires. We measure ourselves in terms of who we are, rather than what others think of us, or what others will have us believe about ourselves. Most important, we learn to deal with the world-machine much as we deal with exercise machines in a gymnasium – as enablers for our own welfare rather than as a set of chains that bind us in every way. treat the world machine as a gymnasium to make you strong and thus remain free in the midst of life in all its complexity.